Oxford Street is the busiest shopping street in Europe and in 2011 it had 300 shops. Oxford Street has about 2.5 km and it follows the route of an ancient Roman road (Via Trinobantina), which linked Hampshire with Colchester. For almost 700 years (between the 12th century and the end of the 18th century) it was variously known as Tyburn Road, Worcester Road and Oxford Road. The actual name of Oxford Street was given somewhere around the year 1729. At the end of the 18th century the area surrounding Oxford Street was bought by Earl of Oxford who developed the area quite quickly. The street was initially famous for the entertainment shows that were given here. Later, during the 19th century the street became popular for the numerous shops that had their headquarters here. During the Second World War, in 1940, the Oxford Street suffered heavy bombing and many buildings were greatly damaged and even destroyed. Since 2004, Oxford Street has been made traffic-free on a Saturday before Christmas. Each Christmas the street is decorated with festive lights and the honor to turn them on is offered to a celebrity. For example, in 1997 the lights were turned on by Peter Andre, in 2003 by Enrique Iglesias, 2004 by Emma Watson, 2009 by Jim Carrey and 2012 by Robbie Williams. In order to get rail transport from Stansted Airport to Oxford Circus Station, you need to take the train to London Tottenham Hale Tube Station and then tube to Oxford Circus Station. 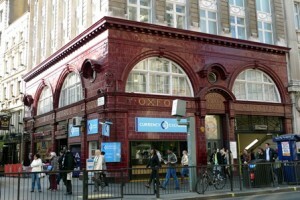 Other options imply taking a taxi service from Stansted Airport to Oxford Circus Station. So as to travel by car from Stansted Airport to Oxford Circus Station you can take the M11 road and then the A106 exit from A12. The journey takes about 60 minutes as it has approximately 38 miles. A journey by taxi from Stansted Airport to Oxford Circus Station with 247 Stansted Airport Transfer will last around 1 hour and 30 minutes (rush hour traffic included). The price for a taxi from Stansted Airport to Oxford Circus Station begins from £59 for a Saloon car.